Learn about COR cellar wine club member benefits and sign up! Wine is the perfect mix of agriculture, art and science – the things that differentiate us as a species and speak to our evolution on this earth. We produce wines as companions to food, and feel the greatest expression is when you can share them with a great meal and all your best friends. It is in this spirit that we were initially enamored by winemaking and our message is that wine is for enjoyment and to enhance the acts of eating, talking and the interchange of ideas. The COR Wine Club is an opportunity for us to offer special small batch releases, new wines and events where we can get together and share the fruits of our labors. The COR Wine Club does two releases per year — one in the Spring and one in the Fall. We offer club memberships for 4 bottles, 6 bottles or 12 bottles per release. Each member has the option of being a shipping or will call member. For those who choose our will call option, your wine will be available for 45 days at the winery. After this time, please recognize that we will ship to the address on file with a shipping cost incurred by you. You may always contact us to make other arrangements. We do have special 1 year Wine Club gift memberships available. We will happily personalize and send to the recipient for you, gifting wine near and far. 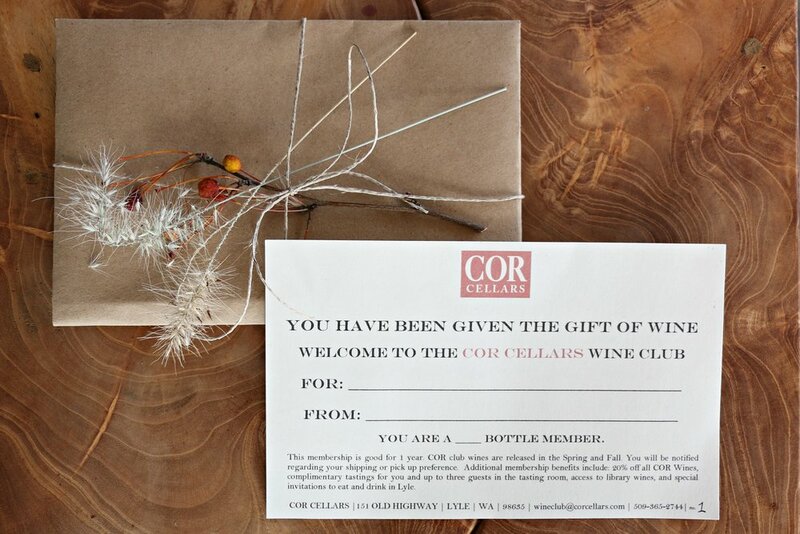 Please email wineclub@corcellars.com or call the tasting room at 509.365.2744 to arrange this gift.